Ottawa, March 28, 2008 – Karen Kain, Chair of the Canada Council since September 2004, announced today she is stepping down on March 31 to dedicate herself completely to her full-time job as Artistic Director of the National Ballet of Canada. "I accepted this position because I passionately believe in the essential role of the Canada Council and thought I would be able to devote sufficient time, attention and energy to it," she said in a letter to the Minister of Canadian Heritage. "Since my subsequent appointment as Artistic Director of the National Ballet of Canada, I have found it increasingly difficult to do justice to both positions." "It is with regret that I accept Ms. Kain's resignation. Over the past three and a half years, she has contributed greatly to the successes of the Canada Council for the Arts," said Josée Verner, Minister of Canadian Heritage, Status of Women and Official Languages. "However, I understand her desire to fully direct her energy to her work with the National Ballet of Canada. I offer my sincere thanks for the leadership Ms. Kain has provided and wish her the very best in her future endeavours." Ms. Kain described her experience at the Canada Council as "deeply rewarding" and thanked the federal government for increasing its financial support to the Canada Council during her tenure as Chair. The government announced last July that the Council's annual parliamentary appropriation would be increased by $30 million on an ongoing basis, following a one-time increase of $50 million over two years. Ms. Kain also presided over the celebration of the Canada Council's 50th anniversary in 2007 and, most recently, the development of a new Strategic Plan and Action Plan to guide the Council's activities over the next three years. "I have been deeply honoured to have had the opportunity to lead the Canada Council for the Arts, which is one of the most important public institutions in the country," she said. "I am particularly proud of the Council's 50th anniversary year, when we drew attention to the outstanding Canadian artists and arts organizations that have contributed so much to the lives of Canadians, with Council support. I am also grateful for the appointment of a new Director in Robert Sirman, who has brought a new dynamic to the Canada Council at this important time in its history." Under the Canada Council's governance policy, Vice-Chair Simon Brault will assume the official duties of the position until a new Chair is appointed by the federal government. The Chair's responsibilities include presiding at meetings of the Council's 11-member Board and representing the Council in its relations with the government, Parliament and the public. 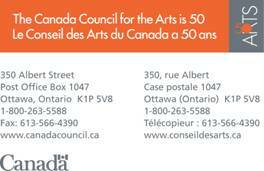 Visit our web site at www.canadacouncil.ca. Read the NEW La Scena Musicale Blog http://www.scena.org/blog for regular news on music and the arts. Voyez le nouveau blogue de La Scena Musicale à http://www.scena.org/blog pour les dernières nouvelles sur la musique et les arts.